Our client in Shell Residences, is now offering his parking slot for rent on a weekly and a monthly basis. Ideal for airbnb guests who is planning to bring a car or has a schedule for more than 1 week. The daily parking for Shell Residences is P 300 pesos/ day. This Shell Residences parking lot would be ideal for lessees staying for at least 1 week. Live next door to inspiration with High Street South’s first tower, One Maridien. Located at the central thoroughfare of High Street South, One Maridien will soar up in the center of the district fronting a central park and directly connecting to Bonifacio High Street. One Maridien opens you to splendid views of the fronting central park, the Retail Promenade, and the glowing skyline, ensuring that you will never feel disconnected from the bustling city that teems beyond your door. For a holistic and abundant life that’s always in motion, everything is within reach at BGC. High Street South is a prime spot of world class living right at the center of BGC. This frames High Street South as a natural extension to the following lifestyle and residential destinations. ABBA 98 Realty & Dev. Corp.
Today our leasing coordinator will check some units that will be available on September. We have a few inquiries looking at furnished and unfurnished 1 bedroom unit. If you are an OFW looking for a good investment in the Philippines or someone who is looking for a dream home where you can retire, you have come to the right place! Here in Abba Realty, we help you acquire your dream property in no time while you concentrate on the things you love the most. Most OFWs do not where to start in terms of property acquisition. We highly urge you to join us on our event this Saturday. 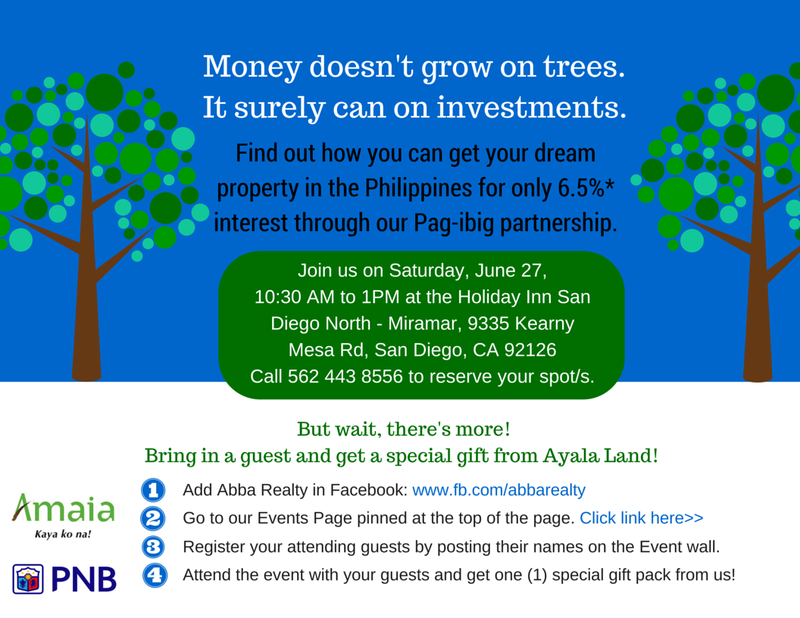 If you are in San Diego, drop by our event and we will be more than happy to orient you on the things that you can do to secure a great investment back home.